“I am against ‘arenas.’ You know what they do in arenas, don’t you? People were dismembered there by animals. I have given the instruction to the minister and we will remove the name ‘arena’ from stadiums. There is no such thing in our language. Look at the definition, there cannot be such a thing,” Erdoğan said in a speech yesterday, during his visit in a vocational school in Istanbul. This unexpected move is a literal dictate by a leader claiming not be an aspiring dictator. Without any consultation he made the decision which will now potentially have serious implications for sports clubs across Turkey, particularly the big ones. After all, Beşiktaş have just a year ago opened their new Vodafone Arena and the naming rights contract is estimated to have been worth $145 million. Now Vodafone might agree to change it or not. The telecom company is hinted to have several other naming rights deals under negotiations in other countries and they might not wish to be forced to get Vodafone Stadium as the new name in Istanbul. Similar problem might arise for Trabzon, where the new stadium also has a sponsored 'arena' name, Medical Park Arena. For other clubs/cities it's not as serious because the buildings are public-owned and not sponsored. One of the country's largest teams, Galatasaray, has already complied with the unusual order by Erdoğan. 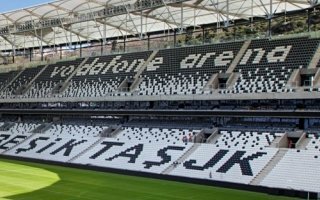 Earlier today the club confirmed that their home ground will be called Türk Telekom Stadium from Monday onwards, changing from the current TK Arena.